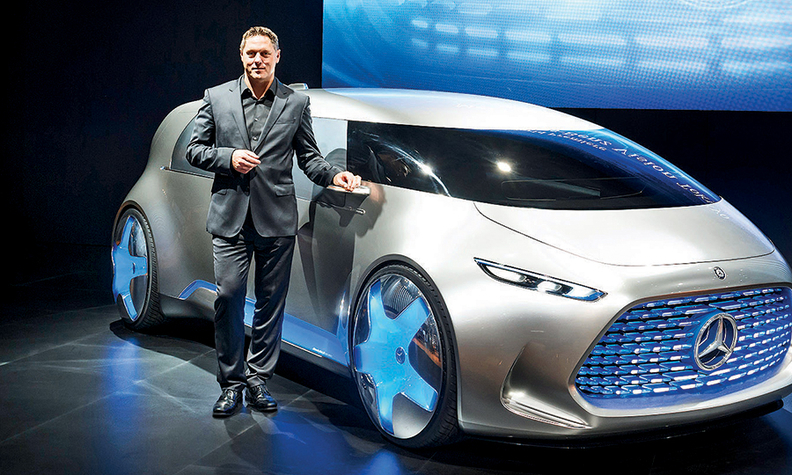 Gordon Wagener has focused on the front ends of some Mercedes vehicles. Mercedes-Benz has gone through a complete turnaround in design in recent years with an expanded product lineup that has pushed it into new car and cross-over segments. It is also forging ahead with plans for dedicated electric vehicles. The luxury brand will showcase a redesigned E-class sedan with advanced autonomous driving features next week at the Detroit auto show. Automotive News Europe Correspondent Jens Meiners interviewed Gorden Wagener, 47, chief of design for Mercedes-Benz parent Daimler, about strategy and the core elements of the brand's future cars and light trucks. Q: In Los Angeles you launched the new SL roadster and GLS SUV, and in Detroit, there will be the new E-class sedan. Can you talk about the significance of those models? A: The E class is sophisticated, stylish and sporty, and it features many forward-looking and unique elements -- such as the "catwalk line" on the flanks and the "stardust" look of the LED taillights. It is an aerodynamics leader, and it will take interior design to the next level. What about the SL and the GLS? You focused on the front end with those models. I think we did a very good job bringing both models to the next generation. If we would have changed the side and the rear, we might as well have started from scratch. But the front end of the SL is perhaps the most modern one in the entire lineup. It is the first series application of the Rennsport grille, inspired by the 300 SL Panamericana of 1952 -- and that's just an evolution of our pre-war race cars. We have shown it with "teeth" on the AMG GTR, and on the SL it is slightly tamed. Will we see that grille on other models? This look definitely lends itself to sporty models, and it might give our full-fledged AMG models an even sharper identity. You are a fan of the classic luxury grille with the upright hood ornament. Yet on the new E class, you will offer it alongside the sports grille. On the more compact C class, we have an 80:20 split in favor of the sports grille. With the Avantgarde-Elegance dichotomy, it was previously marketed as a more conservative choice. Now we want to stress the luxury aspect. Of course, the sports grille is bold, large and sporty. But the luxury grille has a future, and we will carry it forward intelligently. How can you develop Maybach? Maybach is our luxury subbrand, but we are just at the beginning of its relaunch. Its success makes us very confident to evolve it further. But we need time. Mercedes-Benz has confirmed plans for a fully electric car. How can this technology be differentiated as opposed to its plug-in hybrids? Our plug-in hybrids are close [in design] to our diesel- and gasoline-powered cars, with a small amount of visual differentiation but no purpose-built design. A full electric is a different topic. We have a strong strategy, and if you look at last year's concept cars, they can give you some indication of where we are going. A full electric would definitely have an expression of its own. We will keep the grille, although I can't tell you yet in which form. At the Frankfurt auto show, you showcased some remarkable aero effects. Will we see them in series production? Our Frankfurt concept was inspired by the airflow and streamlined spirit of the 1930s; we wanted to show that an aero car can look beautiful. The aero effect, with the long tail end, brings significant advantages at highway speeds; and this is important in an electric. You are a pioneer of four-door coupes. Others do two-door SUVs. Are you considering such a model as well? No. SUV customers want space and practicality. And the last thing we'll do is an SUV convertible.